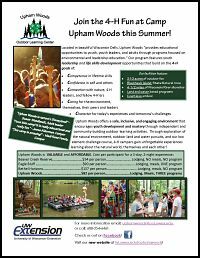 4-H Summer Camp Flyer and share Upham Woods highlights with your campers, parents, counselors and adult volunteers. 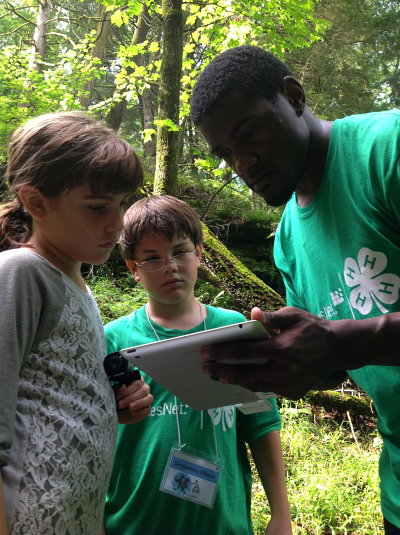 Every year Upham Woods hosts several exciting 4-H Youth Development events including the Operation: Military Kids summer camps, Arts Camp, and the Youth As Partners in Civic Leadership Conference. Summer is an action-packed and wonderful time at Upham Woods! We have many visiting groups over the summer including the annual summer 4-H camps from over 30 counties and others such as scout groups, youth organizations and adult professional development workshops. The winter season is also a great time to experience all that Upham Woods has to offer! Through programs like Nordic skiing, snowshoeing, and broomball, youth and adults learn engaging, lifetime winter sports that a high percentage of people stay committed to. Some outdoor activities, such as skiing, are particularly valuable to youth because youth tend to pursue, or “track” the activity through childhood and into adulthood. Outdoor, physical activities can serve a dual positive function for youth: be a tool to help combat the nation-wide obesity epidemic and a tool for positive youth development. A variety of positive changes will be implemented at Upham Woods in Summer 2019! Changes to our scheduling, staffing and program at Upham Woods reflects the changes to UW Extension, listening to the needs of 4-H Youth Development educators, and discussion of what the best version of summer camp at Upham Woods could be. Click here to learn all of the details of these positive changes. Be sure to look for all of the increased support Upham Woods will be providing to your programs along with the process to submit reservation requests for summer 2019. How do I reserve my dates for 2019? Review the Summer 2019 Calendar here. Each session block has been labeled; use these labels to create a list of your top 4 choices. Submit your requests using the Qualtrics reservation form from now until April 6, 2019. You’ll notice that instead of entering individual start and end date for your camp, you will choose your top 4 choices of session blocks shown on the calendar provided. On May 4, you will receive an email with your contract, approved session block, and a request for a deposit. Return the signed contract with deposit by June 1, 2019. Great counselors make summer camp awesome! Counselors can be youth ages 14+, adult volunteers and 4-H staff. We offer two sessions of camp counselor training in the spring. Upham Woods offers a safe, inclusive, and engaging environment that encourages youth development and mastery through independent and community-building outdoor learning activities. Through exploration of the natural environment, outdoor land and water pursuits, and our low element challenge course, 4-H campers gain unforgettable experiences learning about the natural world, themselves and each other! Residential environmental education programs provide the backbone of Upham Woods. Residential programs are popular with school groups, home school groups, scouting programs, and youth groups. Programs vary in length but are typically two to five days long. Groups can choose from a wide variety of programming options and themes. Through a combination of Upham Woods staff and group leaders, environmental and outdoor education lessons are presented through experiential, hands-on activities. Consider adding some of these unique summer challenges to spice up your group’s stay at Upham Woods. A group loses points by leaving lights on/faucets running, putting recyclables in the trash, etc. The CCC is introduced during youth orientation and explained at the second meal. If the group earns enough points, they earn either a Blue ribbon award or Red ribbon award to take back to the county, and get to put a “feather” with their county name on the display board in the Dining Hall. Stump the Naturalist is when campers submit questions (within guidelines) to the tree “stump” in the dining hall for the naturalists to answer. If the naturalists can’t answer correctly, they get “stumped” and the camper gets a tree cookie to take home. These are all optional activities to include in your camp schedule. We recommend choosing your favorite two activities above! Groups have the choice to stay in rustic cabins or a dormitory. Family style food service is available to groups comprised of 20 or more participants. Guests utilizing Upham Woods for day or residential programs have a wide variety of environmental and outdoor education and recreation courses to choose from. Take a look at the full list of program offerings here. If your group is interested in visiting Upham Woods, please contact us. We will be happy to discuss visitation options and to help plan your visit. We can be reached at 608-254-6461 or via email at uphamwoods@ces.uwex.edu. To schedule a program, first visit the Upham Woods Calendar to identify available open dates. Once dates are found, please fill out an online application to reserve dates. You will receive an email confirmation of your reservation acceptance. A deposit of $100 per night ($50/day visit) is required within 10 days to hold reservation date(s).